In so many ways and in so many places we can be challenged on what we have stated that “We Believe” for what seems to me at least a lifetime. Folks appear to be more eager than ever to hold a person to a measuring stick of their own choosing for every action, decision and choice that we make. When exactly did they, or if we’d be honest with ourselves, did we become the “judge and jury” over what others do or say? It is my hope and prayer that as you read and click through these, there will be people that the Holy Spirit puts upon your heart to send one to, share one with or possibly even call that person up to Encourage them because of reading one of them. They are indeed pointed – which should lead us to Praise the LORD for being SO generous to us in providing His Only Son to serve as our Substitute so that we might have the opportunity to gain Heaven on the upswing of receiving Christ as our Lord and Saviour. Do we often consider what other people say? We most likely have heard something similar to this phrase being used within our hearing sometime in our lifetime: “If you had only listened the first time, then this would not have happened, but you wouldn’t listen now would you…” Many of those times someone has given a word of caution to us about this one thing or another would happen if we chose not to listen to the advice and warning — if you’re like me, I did it anyway. By not listening, the “that will never happen to me” event turned into reality – in the most real of manners. Even to a point, as is often the case today in a VERY out of touch reality, we will be issued warnings, like “I’m going to count to three…” or “You are really getting to get yourself in trouble if you continue…” So, with a far less structured system than when I was a child, we know of a far more relaxed penalty system with even less restrictions. Repeatedly, the same things that would have me “remembering who was the boss”, are all but dismissed as if they will never carry a penalty at all. Have we ever wondered how God the Father feels when He has given us repeated warnings? 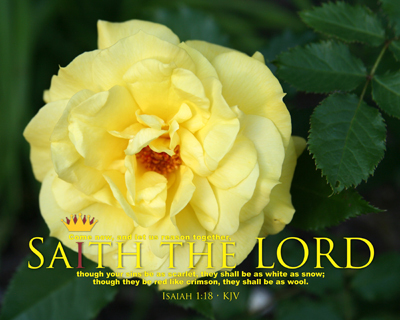 Interesting how many times “Saith the LORD” is in the Bible – that is a lesson in itself. 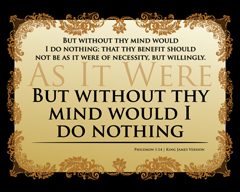 The Holy Spirit impressed on me to do something never done before in a Bible study – go backwards. Read the end result of disobedience first, then all the warnings, going back to the original request to gain a better picture of how they got into SO much trouble. Used three pens – green for good/positive, red for bad/negative and black for neutral/statement. What was discovered? The folks in the Bible are some REALLY stubborn people! Reminds me of me when I don’t listen. As with many of the items that we see and phrases that we hear, some are destined to become ones which register in our minds as making sense and are applied to what we do. Life is made up of the decisions and choices that we make, which each and everyone of them have consequences that last more than just a lifetime. We have the responsibility to choose wisely, which has to involve God’s Word for the consequences to be good ones and the impact thereof fruitful. Being in a world of very diverse people groups, we tend to call a large group of people living in a single area from various backgrounds, a melting pot of cultures. These orchids stood out to me as there were hundreds of them on each stem, with a captivating color and tones throughout. That same kind of difference should be seen in us wherever we find ourselves. The choice to Serve the Lord is one we make daily, whereas most folks think you make that one decision the try to live it out in a daily life. We choose to go to work, visit folks, witness for the Master, have a Christian testimony – all on a daily basis. If you are honest and think about it a moment, those can be decisions that are made moment-by-moment. 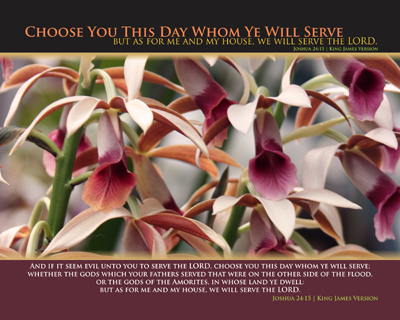 Will you choose to Serve the LORD? Are you willing to declare that your house will Serve the LORD? Will YOU choose this day WHOM ye will SERVE? We need to be reminded of it daily. Where to even begin with this one – one, this was written by our 15 year old Courtney Turner after a discussion on a written piece she did in June which had a “line” out of kilter. Honestly couldn’t tell – of course after she wrote “DO NOT CHANGE ANYTHING!” at the top of them poem – what was ‘missing’, just knew something needed adjusted. She looked at it a couple of times, then I handed it to her with a pen – stating that it wasn’t to come back until it was completed… That took about 2 minutes… Of course with SPECIFIC directions on what to re-arrange and NO CHANGE on anything else. The Cross Words Series is one of those sets of prints which came by request to be matched up with something of my choosing, to make a package of images which would be an absolute show stopper. The request came from a graduated Senior from a Christian based school in the Eastern part of North Carolina – who happens to be my wife’s niece. First came the speech/letter that she wrote in which to draw the Scripture verses from to arrange into a collage. Next came the research time spent to build a “wrapper” so to speak around the thoughts and intents pointed out in the letter. In the end, a complete set of prints would be built that have cohesion and celebrate the Holy Spirit working inside of the born again believer. 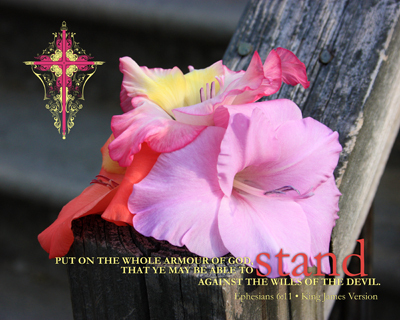 No doubt you will notice there are three blooms – Gladiolas – arranged cascading over each other – simple enough to depict God the Father, the Lord Jesus Christ and the Holy Spirit. The verse chosen for this arrangement is Ephesians 6:11 KJV – with the focus being placed on the word “stand”, giving us the before of what must be had to stand and underneath the word the why to do it. 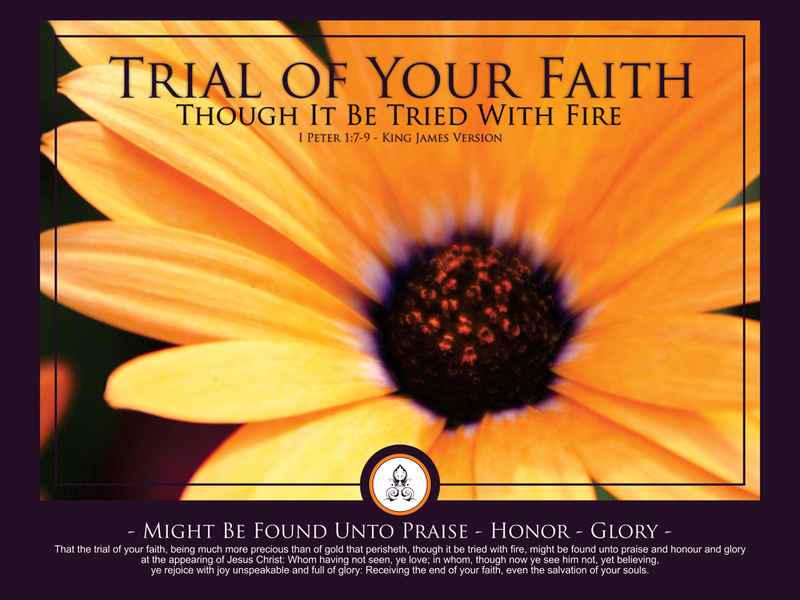 The last print in the Series is built upon the word “faith” – why to have it and telling us where to get it from. Have we done all we can to Stand? Have I? Have you? Has it been noticed where these photos were taken… It begins at HOME, not at Church – these photos were taken on the corner post of our porch, where vaguely the steps can be seen blurred in the background. Our HOMEs are what depict the strength of our Churches – our Stand begins with each of us personally. My FIRST altar is at home, my second one is at my Church house. These are some of my Cross Words, will you join me in making them yours too? There has never been a greater need for an effective, available means of Encouragement than there is today. That’s why I am particularly pleased to share with you that the Website DeliverTheWord.com has recently been brought on-line and is ready to be accessed by everyone who would wish to do so. We all know that sites can come and go. While we are certainly excited to present this site to each of you, it is important to point out that the people who this site represents have spent years working along side you in various capacities. Those people would be us, the Turner family and we have been preparing long and hard for the eventual debut you are witnessing just now. This site was first developed in 2001 over which has gone through several periods of differing phases, which were building blocks for the site today. This final work has been purely a work of Encouragement fueled by prayer, fasting and biblical focus. DeliverTheWord.com is a site of sites if you will – which already contains over 100 individual sites (and growing), as each Series has a site theme which sets it apart from all the others. Some 49 or so of them are turned on right now, with the remainder of them being worked on, tweaked, updated and content being added. From the very first glimpse of the site, the introduction to those sites will become evident – as the front page contains the main or theme images to each of the Series contained. These photos represent over 15 years of images put to Scripture to become what you will see on this site. Having a delivery mechanism to give the shout out for Christians who want to Encourage others may at first appear to be something simple and basic… It has proven to be more of a challenge than we expected, but one where the rewards FAR outweigh the costs! 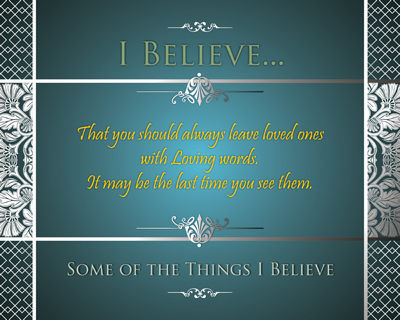 Each and Every design developed for DeliverTheWord.com is available for your use to help you Encourage others. Each Series contains images which feature sharp photographs set to King James Version Scripture quotes based on Biblical truth and many others which are Encouraging. 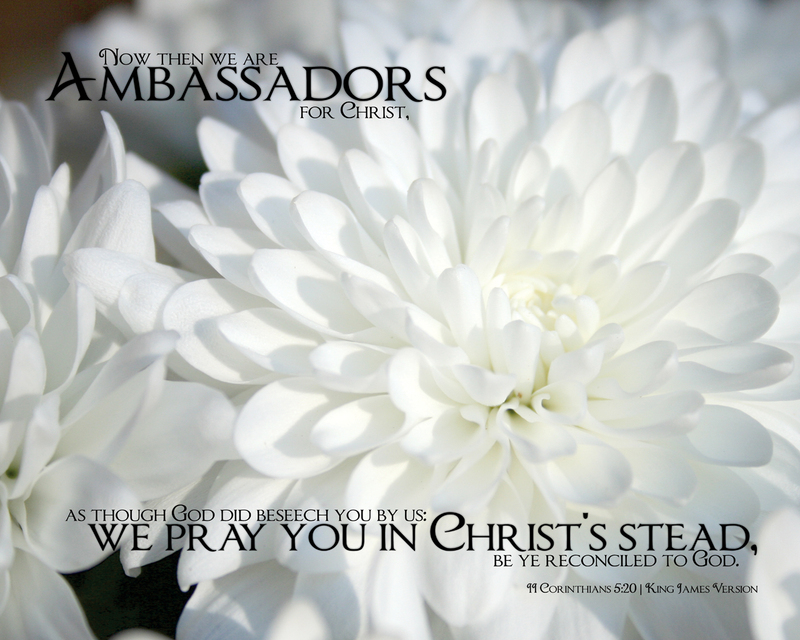 In this Introductory issue of The Encouragement Chronicles, three Series are going to be introduced, the first two of which are The Love of God and We Are Ambassadors. These first two Series were NOT the first ones which was designed specifically for DeliverTheWord.com, that is where the third one comes in, which is Trial of Your Faith. 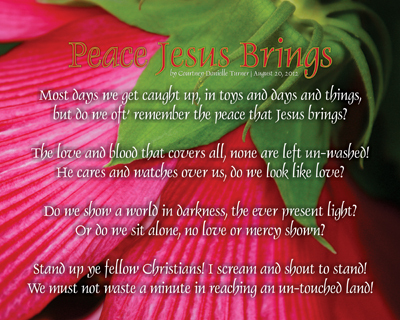 Each of these Series cover dark days and periods of those involved lives, it is my prayer that each person who reads this Chronicle will understand they are the inspiration for my daily Christian walk. This incredible story involves two ladies, Ms. Nancy M. Cook and Dean B. Strickland. Ms. Nancy is a dear friend who, along with her husband Bro. Jack, serve the Lord through Amazing Grace Missions. They are Missionaries to America Through Fairs. Ms. Dean is my Grandmother who, along with my Grandfather PaPa, live in Knightdale, North Carolina, whom I cherish greatly. This story also involves a few other things including two sets of roses, one set taken at a dinner and the other are my Grandmother’s Ball Mountain Roses. Another would be a hymn written by Frederick M. Lehman | 1917 | The Love of God. After several days from the time the Cook’s had left from Raleigh, North Carolina, we began to be a little concerned that we had not heard from them, as they had left out on the way to the great state of Georgia – Jefferson to be a little more precise. As I’d had some time to snap a few roses on the Thursday before, started working on them to see if anything could be put into some type of a set. The roses came from an absolutely incredible group of corsages purchased for a celebration dinner in Wallace, North Carolina which took place at the Mad Boar banquet hall. The corsages were made with multiple strands of fresh water pearls as the banding and petite red rose buds. The very first photo chosen to check quality, lighting and to see if there was anything which could be used provided to be a very subtle, but rich color set image which immediately was impressed upon me to drop a line to Ms. Nancy, include the photo and a note because it was troubling me that something was wrong. Prayed about the situation, then fired off an e-mail with a photo of just the corsage. My initial message to Ms. Nancy was one to inquire from a funny tone, while also letting her know that we were concerned for them – all three of us have detected a moving in the troubled waters so to speak with some prolonged difficulties. The Holy Spirit impressed upon me to make the contact, with that EXACT photo. Knowing that she liked red roses made it make more sense to be me, so without hesitation, attached it to an e-mail and clicked send – having NO idea what would come next. Ms. Nancy zipped me back an e-mail early in the morning the following morning with the first of a two part series of sharing, heartache, encouragement, praise, humbling and of course a healthy dose of bantering! Told her of the detection of some anguish and heartache detected in her phone calls and e-mails, which included singing the “The Love of God” and indeed that it would be WORTH IT ALL. One will NEVER know what a person is stumbling over, wrestling with, being hindered by or what is going on in the process of a day – if one is not willing to put down self and make an investment in another persons life. 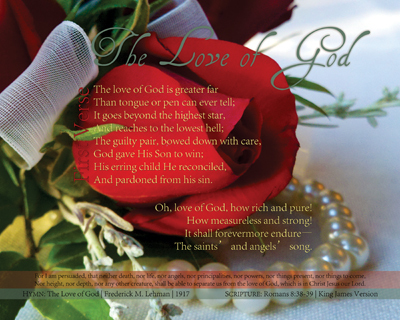 Quickly took a look at my “music vault” so to speak to look up “The Love of God” to find those words, setting them to the first rose/pearl image sent to Ms. Nancy -which “started it all” for this series of prints. As best as can be discovered, there were two original verses, with the third being added at a later date. Are we persuaded, I mean REALLY persuaded, that NOTHING shall be able to separate us from the LOVE of God? God loved us SO MUCH that He gave the BEST He had for the WORST of us – which includes YOU and ME – so that we would KNOW His Son, the Lord Jesus Christ! How we care, how much we care, how we go about that care – will be guided by what you and I WILL NOT let separate us from “The Love of God” – now and forever. We’d be well to heed EVERY prompting of the Holy Spirit to speak with EVERYONE He places in our pathway. By humbling ourselves, we will clearly be able to respond favorably to what the Holy Spirit places upon our hearts to do for the God of EVERYTHING. Listening takes time to learn to do, that comes from our willingness, as well as yearning after the things of God. Will others know the “song” that is upon your heart, or better yet, will they tell you the “song” that is upon theirs, because you took the time to communicate and show them how much you CARE? That my Brother and Sister in the Lord is EXACTLY what this site is ALL ABOUT – pointing EVERYONE to the Cross and being one who will be there to help them get there! This site is dedicated to two VERY SPECIAL ladies in my life – one of whom I’ve known all but just a couple of years of my life and the second one whom I feel there is a bridging connector that transcends time. Without at first realizing it, this Series applies to them both and they complement each other just perfectly – there a both just a tad crazy and they both love me and my girls!!! The first one whom I’m speaking of is my Grandmother Dean – or as I’ve always remembered calling her “My Deanie”. The “Mountain Roses” which make up ALL of the additional shots for this series were all taken of her rose bushes at my Grandparents home in Knightdale, North Carolina. Nearly 490 shots (which will show up in multiple Series offerings) were taken of those beautiful bushes and “little roses” that bunch up like pillows. They are all red – which of course goes with the corsage photos taken at the banquet in Wallace, North Carolina. The second one whom I’m speaking of is my Big Sis Nancy – who is the individual that the Lord has blessed me with (one could see and TAKE this from multiple vantage and view points depending on time of the day) for more than just building this SPECIFIC Series. Now that of course that EXACT same trouble that is gotten into multiple times an hour at times is “appearing”, you’ll just have to hear me laughing all the way to the closing letter of the paragraph! Do you know of anyone that is alone? Perhaps you are the only person that knows they are… What if you are that person, would you want someone else to know? Could it be possible that the person you just had come to your mind doesn’t know the Lord Jesus Christ as their Saviour? Or is it that they have been so discouraged by time and so many events that they have forgotten Who He is? These are difficult questions, which can have so many different facets to ponder… My purpose in asking them is to challenge you to be an Ambassador for Christ, one who will pray, one who will go to where they are, one who will actively seek to Encourage – that person who is alone… We are to be faithful ministers (each one of us) as we seek to Encourage others, for we truly can only see on the outside, where God knows the heart. Even if all we can do is be an Encourager, being faithful to be directed by the Holy Spirit, to deliver God’s Word to those persons we are convicted to do so. They are the ones who will have to want to rise up from where they are; we cannot. It matters not what the challenge is or where they find themselves, we each can Encourage. Please consider being that Ambassador For Christ to all those you come in contact with, especially to that special one who came across your mind who you know is alone. 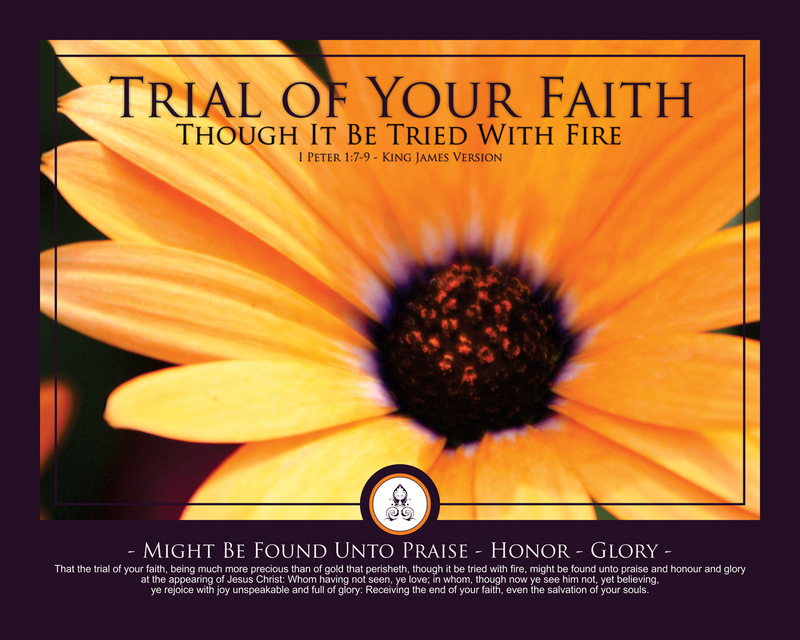 This set of prints developed for Pastor Kerby Campbell of Treasured Trials Ministry. Pastor Kerby, his wife Ms. Kelli and their two sons, Issac and Jack came to warm our hearts at Beacon Baptist Church in Raleigh, North Carolina on Sunday, July 17, 2011. As part of our “Summer Sunday Nights” in July, Bro. Kerby shared with us his testimony and message of going through and continuing to go through this trial. Bro. Kerby is a church planter from Maryville, Washington. On February 17, 2010, he underwent routine knee surgery which involved a failed spinal epidural and resulted in a condition called arachnoiditis, which is a lifetime of severe pain. Realizing God makes no mistakes, Bro. Kerby wants to give God the glory and help others realize that our trials are treasures from the Lord. They want to help each of us give God praise, honor and glory, through our trials, whether they be physical, emotional, financial, relational or mental – realizing they are treasures from God. Everyone has them… How will you handle yours? Whatever the challenge or difficulty, we can be sure to handle each of those in a manner that is Honoring to the God of Glory by the Power of His Son and Saviour Jesus Christ! Isn’t it always interesting how some places seem to conjure up certain ideas, emotions and recall of things we have seen, been or participated in before? For me phrases do that, which for anyone that knows me knows I have around a pen, pad and/or my phone to jot them down. 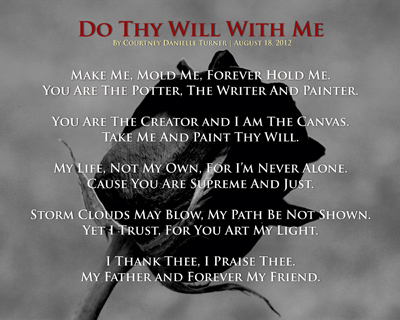 The list for this Series, “My Father”, actually is someones photograph of eighteen (18) phrases jotted down in the fly leaf of a book or possibly a journal, as they had spent time reading God’s Holy Word, the Bible. 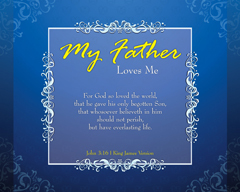 Each of them written down so carefully must have reminded them of what “My Father…” meant, was and continued to be for them. A specific passage book and verse was handwritten with each entry. One can tell it was no accident that they came from various books and places in the Scriptures. They had spent time with not only their Creator, but also with the Creator’s Instruction Book! Could others, by looking at what you or I write down, tell where we have spent our time on any given day? Would they find any intrigue by seeing what you or I have left open on our desks, on the dining room table or for that matter — anyplace? Would they be able to surmise Who you and I have been spending time with on a regular basis? 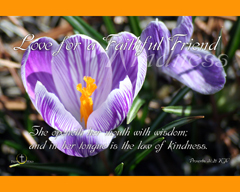 We each reflect pretty much what we put into us, where a steady soaking from the Word of God will cause us to have Love for others, a Caring spirit for others and show forth a Compassion that can only be gotten by spending time with Almighty God Himself! We all, in varying ways, like neat and nice looking things especially when they are presented to us as recognition of a job well done. Many times those recognitions come in the form of diplomas, advanced degrees or maybe even when a project is completed, there are people who will enjoy or benefit from it years on down the road. Each time we see that certificate, diploma, memento or trophy we will be reminded of what it took to get to that point in our lives. Some of those things are indications of difficulties overcome instead of some great feat being accomplished — nonetheless, they represent a period of time we have experienced. The perspective given of Revelation might surprise you. Allow these ten (10) images kindle up a few names of your friends who you want to share what you’ve been reminded of just now.